And, in October 1984, she was assassinated. The Tamils of Sri Lanka will be India's natural allies because we are brothers and sisters. Why should we support the Sinhala government? Marumalarchi Dravida Munnetra Kazhagam leader Vaiko is known for two things -- his penchant for switching alliances on the eve of elections and his fearless support to the Tamils in Sri Lanka. 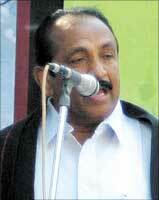 Vaiko -- V Gopalaswamy Naidu -- was born in 1944 in Kallingapatti village of Tirunelveli district of Tamil Nadu. He is an agriculturalist turned lawyer who got interested in politics. His fiery speeches attracted crowds and his unflinching support for the Tamils in Sri Lanka against the perceived onslaught of Sinhalese culture has made him popular in the state. He entered the Rajya Sabha in 1978 and has been member of the Upper House for three terms. He has also been elected to the Lok Sabha twice. In Parliament whenever he stands up to speak, he attracts attention with his straight talk and sometimes emotional speeches. Always attired in a black stole, he says, 'till?social justice is achieved for the exploited classes', he will keep wearing it. Vaiko is criticised as a hawk by some experts for raising his pitch whenever the Sri Lankan government pushes the Liberation Tigers of Tamil Eelam on the back foot. Many experts believe that Vaiko's politics hardly leave space for Indian diplomacy to manoeuvre the Sri Lankan peace process to India's benefit. That Vaiko does not think so is clear from the first part of his interview with rediff.com's Managing Editor Sheela Bhatt. How do you read the situation in Sri Lanka today? What are the factors behind the current escalation in violence? You will have to go back to the root of the problem. Ever since the British left the island in 1948, Sinhalese started treating Tamils as second rate citizens. They were denied basic legal rights. The first act of discrimination came immediately after independence when they disfranchised one million Tamils. In the 1950s Tamils fought for minimum rights. Their demonstrations were met with state violence. In 1956, the Sri Lankan government brought the Sinhala Only Act (which declared Sinhala to be the only official language) and Tamilians were relegated to second position. They introduced the standardisation theory. That insisted that a Tamil child should have 60 per cent marks while for Sinhalese children, 35 per cent was enough to get admissions in colleges. More or less, it was like Apartheid in South Africa. In the 1960s they started decimating symbols of cultural identity of the Tamils. In 1957 and 1965 the Sri Lankan government entered into two agreements with Tamils. S ?J V Chelavanayakam represented the Tamils and Prime Minister Solomon Bandaranaike was from the government side. In 1957, before the ink could dry the agreement was thrown into the dustbin by Bhandarnaike. Again in 1965, the Tamils were cheated and the agreement was not implemented. In 1970s, a brutal crackdown took place, Tamil women were raped, temples were demolished and extra-judicial killings and detentions became the order of the day. The Tamil youth realised that unless they fight they won't get the basic rights. The armed struggle of Tamil youth is the contribution of the Sinhala government's racist attitude. But times have changed, so why not look forward? To understand that we have to look at the history of the island country. The island had two nations, Sinhala and Tamil. Both had separate kingdoms before the Dutch came. Before 1947 also they never lived together. In 1970s Tamils realised that they will always second rate citizens. They wanted a sovereign independent Eelam. Sinhalese leaders refused any kind of sovereign rights and asked Tamils to live within the territory as one country. Then, Chelavanayakam, the great Sri Lankan Tamil leader challenged the government during the Parliament election. He said, "I will go to the people to raise the plank for a separate Tamil Eelam. If Tamils want to live within the territory they will vote against me." In the elections, around 90 per cent voters were with Chelavanayakam. It was the referendum which proved that Tamils want a separate Eelam. Along with 14 Tamil MPs, Chelavanayakam went to Parliament and brought a resolution for a separate Tamil Eelam. Then, changes took place swiftly. In 1976, on the historic day May 14, Chelavanayakam convened all Tamil groups under one banner in Vaddukoddai. The famous declaration of Eelam was drafted and adopted by the Tamil United Liberation Front. It's a beautiful resolution. After the declaration, when the election came in 1977, the TULF on the plank of a separate Eelam contested and won all the seats in Tamil majority areas. Sri Lankans Tamils wants a separate country. Why do Americans and Indians try to preach Tamils of Sri Lanka? Who are they? People will decide if they want to separate or not. Czechoslovakia took the decision over the table and decided to separate. In East Timor, a referendum was conducted. Bangladesh was carved out with the military help of India. Tamils of Sri Lanka want a separate nation why should America or India dictate? Montenegro could become independent when 52 per cent voted for a separate country. Here 99 per cent of Tamils want a separate Eelam. Even now, under, the supervision of United Nations let a referendum take place. But is the LTTE and its violence defensible? In mid-seventies, the New Tigers -- that's the original name of LTTE -- was started by Velupillai Pirabhakaran. As the LTTE grew, in 1981 the Sri Lankan government unleashed a reign of terror. The great Jaffna library was burnt down. Many precious Tamil books were burnt and lost. I must mention that then Indian prime minister Indira Gandhi was alert and was against allowing the Americans to enter the island for strategic reasons. India was aware that American eyes were focused on Trincomalee port. It's a natural harbour and some consider it more important than Diego Garcia. It's important for the Americans. Indira Gandhi didn't want Americans to enter Sri Lanka. She helped Tamil groups. The Indian Army trained the Tamils on behest of Indira Gandhi. In those days I was very close to the Tamil groups. Even the LTTE was given training. Not only in south India, even in five places in north India training was given. In 1983, the Welikade massacre took place inside a prison in which 56 Tamils inmates were killed in cold blood. Then in the same year there were terrible anti-Tamils riots. That shook the entire Tamil Nadu. It reached a boiling point. The then Tmail Nadu Chief Minister M G Ramachandran said everybody should wear black shirts to protest. I also took up a fast to protest the atrocities. All leaders came to support us. On August 14, 1983, I ended my fast on the request of some national leaders. On August 16, Indira Gandhi said in a speech in the Rajya Sabha said that what is happening in the island is genocide of Tamils. In 1984, Indira Gandhi's last speech in the Rajya Sabha was in response to my calling attention motion. In my speech, I told her, 'you have created Bangladesh, you protected the Bengalis. Now, you have to save the Tamils. You create Tamil Eelam and you will be worshipped for the generations to come!' That was my most emotional speech. To that, she replied, 'I share his concerns. Tamils are the original inhabitants of the North and East of the island.' These are her words that the Tamils are the original inhabitants. The second wave of Tamil immigrants came during the British period when they were taken as labour. Those Tamils were of Indian origin but the first category were original inhabitants. After the speech, I went to Mrs Gandhi. I thanked her and said, "Madam, we are grateful to you for your kind observations. You can create Tamil Eelam as you created Bangladesh." She said, "How can it be? Tamils are scattered in other parts like plantations and in the south. They will get killed if any military action is taken." I told her, "Madam, you could have a blueprint, you could evolve a strategy of creating Tamil Eelam and as well as protecting Tamil workers. The strategy can be worked out." As we were talking, other ministers came closer so I stopped. Then, she said, "You have to co-operate with me, instead of getting excited over the issue." After two days the House was adjourned. And, in October 1984, she was assassinated. Indira Gandhi had a vision. During the 1983 riots, she deputed senior people to get a first hand account. Then foreign minister P V Narsimha Rao and senior diplomat G Parthsarthi, who had cabinet rank, went to Colombo. Rao made a statement in both Houses on his visit to Sri Lanka. Indira Gandhi knew the issue but when new prime minister Rajiv Gandhi came, a new set of bureaucrats too came in and they totally misread the situation to him. Why do you say Prime Minister Rajiv Gandhi was misled? I blame [former high commissioner to Sri Lanka] J N Dixit and Junior Parthasarathy (diplomat G Parthasarathy) and some other officers for the debacle in Sri Lanka. [Former President] J R Jayewardene cunningly trapped India into an agreement. He could not face the attacks by the LTTE so he cleverly invited India to face the LTTE. As the events unfolded, [LTTE leader V] Prabhakaran was brought to New Delhi. He was told 'you will be the only representative of Tamils'. They didn't speak at all about the Indo-Sri Lanka agreement. He came with high hopes. On his arrival he was immediately locked up in Ashoka Hotel. I tried to meet him as a member of Parliament. When I attempted to enter his room I was stopped. I held a press conference to declare that Prabhakaran was being kept away from the public. Prabhakaran's team was not given a copy of the Indo-Sri Lanka agreement. These are the words of J N Dixit. Balasingham told me the exact words. Prabhakaran thought he cannot oppose India at that juncture. The Indo-Sri Lanka accord was thrust on them. Even after the accord the State-sponsored violence went on, Sinhalese were settled in Tamil areas in the Eastern province. In those areas Tamil Musilms were won over by the Sinhalese. What made Rajiv Gandhi displease Prabhakaran? What could have been his calculations? At that time the Bofors scandal exploded. It was a rude shock for them. Dixit didn't visit the Sri Lankan Tamil leader who was on fast against settling the Sinhalese in Tamil areas. He died. There were many such mistakes by India. As per agreement, on October 3, some 17 LTTE commanders were allowed to come to India but before that they were arrested by the Sri Lankan army and kept in custody. The LTTE contacted Indian officials. Indian generals had sympathy for the LTTE. They informed the government but Dixit misled the government. He allowed these commanders to be taken to Colombo so that Prabhakaran would come to terms and accept the Indo-Sri Lanka accord. In Palali, Indian soldiers had put a cordon to prevent Sinhalese soldiers from detaining the LTTE commanders. On October 5, instructions were given from New Delhi to withdraw the cordon. As the cordon was withdrawn Sri Lankan armed soldiers went to arrest them but they swallowed cyanide within minutes and 12 of the commanders died on the spot. This was the turning point. This was the major factor of confrontation. On November 11 I raised questions in the Rajya Sabha, but Natwar Singh could not reply to them. In retaliation, the LTTE attacked the Sinhalese and in return the Indian army blasted two newspaper offices and television stations of the LTTE. The Indian army sent a Special Commando Unit to Jaffna. They landed by helicopter in Jaffna to capture Prabhakaran but no Indian commando could survive. In four days of heavy fighting 14 Indian tanks were crushed. The LTTE decided to fight and die. Do you know what happened after that? Rapes and killings. How many women were raped! How many innocent people were killed! Sri Lankan Tamils thought India will be the saviour but India played a mercenary role for the Sinhalese government. These are all facts of history, and history should not be conveniently buried. How do you see the US influence in the region? Americans are helping the Rajapakse government because they think maybe it will allow them to have a foothold in Trincomalee. The Rajapakse government is getting weapons from Pakistan and China. [National Security Advisor M K] Narayanan is telling the government that if India doesn't provide military help Pakistan and China will give weapons to Sri Lanka. I am asking whether any people of Pakistan origin are living there? Whether people of Chinese origin are living there? Don't forget we are 70 million Tamil citizens of India who have got an umbilical relationship with the Sri Lankan Tamils. Don't play with fire. Let Pakistan and China give weapons. For your geo-political interests why should the Tamil people be made scapegoats? During the Bangladesh war the Sri Lankan government supported Pakistan. They allow them to refuel their planes. For geo-political reasons you should support Sri Lankan Tamils and support Tamil Eelam. Trincomalee will be there, too. Americans are trying to intimidate the whole world today but they are unable to shake even an inch of Cuba. Tamil Eelam will be another Cuba. Sri Lankan Tamilians will be with you. Why are you afraid? The southern most point will be your protection. What will happen if you help the Sinhalese? The seeds of hatred and frustration will be sown in the minds of the younger generation of Tamils in India, if not today then it will happen tomorrow. India is trying to help the regime which is trying to decimate the Tamil population. Then, another Kashmir will be created in the south. I am worried about the unity of India. Some people say if Tamil Eelam is achieved then people will ask for a separate Tamil Nadu. This is idiotic. Bangladesh was created, are Bengalis of West Bengal asking for a separate State? But the religion of the majority is different in both cases. Hindus and Muslims were on both sides. If religion is so important then Iran and Iraq would not have been fighting. You know how and why some people may quote the Kashmir insurgency if the Indian government took some bold steps. No. Sri Lankan Tamil and Kashmir issues are not comparable. Kashmiris are not treated as second class citizen of India. They are enjoying more rights than the citizens of other parts of the country. You should not equate Kashmiris with Sri Lankan Tamils. For every conflict there are different views and causes. In India also the LTTE doesn't have support. People abhor its violence. People don't know the history of the issue. They don't know the facts. The entire Tamil population of Sri Lanka is with the LTTE. Don't think that Indian Tamils are not supporting the LTTE. Many believe that because New Delhi has to consider the Tamil opinion within India, it's unable to take a bigger view to influence the Sri Lankan government to bring peace in the island. Do you agree? Delhi has the binding duty to oppose the genocidal attack of the Sinhala government against the Tamils. India has repeatedly said that India stands for the territorial integrity of Sri Lanka. United States Under Secretary of State Nicholas Burns recently said the Sri Lankan government has the right to protect its territorial integrity and security. Who are they? India has no right, America has no right. We don't want India to help the Tamils to separate their country. We don't make any request to India to help the liberation movement. But, destiny has to be decided by the Tamils in Sri Lanka. What right India has got, you kindly tell me? But because of domestic politics of Tamil Nadu India is taking a backseat and that vacuum is being filled by the European Union and the US. You wait and see. When the Tamils are killed in Sri Lanka, Tamils in Tamil Nadu will not sit as idle spectators. But Sri Lanka is not your country. Indians have limitations. But don't forget we have got an umbilical relationship with them for the past so many centuries. Just 200 years back what relationship did we have with the people of Uttar Pradesh and Bihar? Was India one country before the British came? You tell me, what relationship have I got with a UPwallah and Biharwallah? After the British left we accepted India as one country. But what can you do beyond a point because Sri Lanka is a different country? We will have to fight. We will give moral support. If the Indian government supports the Sinhala government we will go to the streets of Tamil Nadu to express our anger and will raise our banner of opposition against any such move. India will not commit any blunder that was committed earlier. Last year, India wanted to go for defence ties with Sri Lanka. I have managed to crush it. As a result Sri Lanka will get military support from Pakistan, tacit support from China and diplomatic support from the US. India will get marginalized. India will never get marginalized if it supports the Tamils. Just because Pakistan and China are helping Sri Lanka you are thinking of helping them, then I tell you, you are entering a dangerous path. The future generations in Tamil Nadu will not be the same. Changes will come in swiftly. Why do you want to sow the seeds of despair and frustration against India? You are creating another Kashmir in the southern tip. What is more detrimental? Lastly, can you tell me how you can bring peace in Sri Lanka? There is no solution other than Tamil Eelam. Tamils and Sinhalas co-existing is totally ruled out. What are your suggestions to the Indian government in the short term? The Indian government should prevail upon the Sri Lankan government to stop the killings of Tamils. They should open the A-9 highway [linking Jaffna to the rest of Sri Lanka]. India should not give any assistance, directly or indirectly, for the military pursuits of Sri Lanka. It is believed that Parabhakaran is ageing and is not in touch with the latest global trends. You should know he is a legend. I respect Fidel Castro. Mr Prabhakaran is more than Fidel Castro. His personal character is perfect. He is more or less running the government. In every Tamil household one boy or girl is giving up his/her life for the movement led by him. I claim that he will win the war. He will get Tamil Eelam and the world is going to witness it.